Anyone whose entry into the roleplaying hobby coincided with the Golden Age of D&D will know the name Darlene and immediately associate it with some of the most beautiful images ever to created for the game, chief among them the glorious World of Greyhawk maps that first appeared in 1980. Three decades later, Darlene's work stands out as noteworthy not just for its attractiveness but also for its having given many early D&D products an air at once fantastical and rooted in medieval history -- a heady combination I don't think any artist since has recreated. I had the opportunity to ask Darlene some questions about her involvement in the RPG industry, her artistic influences, and the unusual process by which she creates her art and she kindly answered them all at great length. I urge everyone who posts comments to be courteous and respectful. Thank you kindly for granting me this opportunity to reminisce with you. I hope I will give your readers some interesting things to think about. I send Big Bountiful Blessings to all. 1. How did you become involved in illustrating for role playing games? I came in through the back door. At the beginning of my association with TSR Hobbies, I worked behind-the-scenes. One of my first jobs for them was to create a large two-sided sign in the shape of a shield with a dragon on it. For several years, this sign hung in front of TSR’s Williams Street building in Lake Geneva. This was around 1977 when TSR Hobbies had just the one building and employed only a handful of people. The first TSR person I met was Mike Carr, creator of the Fight in the Skies WWI aviation game. I was a local artist working for a graphics firm in Lake Geneva when Mike came in to update TSR’s next Gen Con flier. By the end of the project, we were dating. When Mike took me to visit his place of employment, the first people I met were Tim Kask, Joe Orlowski, and Dave Sutherland. Working as I did for Graphics Printing, when it came to freelancing, I was naturally associated with design, graphics and lettering. Sometimes, I wonder about the happenstance of my living in Lake Geneva at that particular moment in time. If anyone was tailor-made for graphically shaping the look, identity and public face of TSR, it would be me. With a background in medieval-studies, a familiarity with strange mythological beasts, a calligrapher’s knowledge of manuscripts, and a deep appreciation for fantasy and surrealism, no one could be more uniquely qualified. I could do anything TSR called upon me to do. During those early years, my published work, if not my name, was seen quite a bit. The first module coming with the basic D&D set was In Search of the Unknown (B1). Every person introduced to the genre saw my art on the front and back covers of the module. I also contributed regularly to The Dragon magazine and did the graphic illustrations for the 1980 and 1981 The Days of the Dragon calendars and the lettering for the Realms of Wonder and Dragonlance calendars. In 1983, I designed The Guide to the World of Greyhawk book to appear like an illuminated manuscript, accompanied, of course, by the WOG maps. Highlights of my Fantasy art (sans lettering) include: the above-mentioned B1 cover and back-cover, the cover for The Dragon magazine #37, The Ice Barbarian in the 1981 Days of the Dragon Calendar and The Green Dragon in the 1982 Days of the Dragon Calendar, Monster Card art, The Dragontales Anthology, all interior art for first RPGA Rahasia (R2) module, all interior art for One-On-One game The Amber Sword of World’s End. My art also appeared on the title page of the Dungeon Masters Guide as well as The Rogues Gallery. 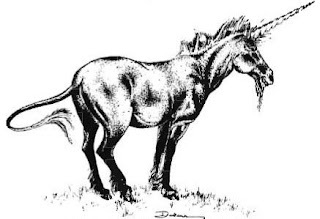 Incidentally, many people consider the DMG title page art—a depiction of a fat unicorn—to be iconic, a wistful symbol of a time gone by, a longing for past pleasures fondly remembered. Having studied symbols and icons, I tend to agree with this opinion. 2. Artistically, who are and were your biggest inspirations? Generations who’ve grown up with RPG materials readily available probably don’t realize just how scarce pictorial representations of monsters were in the pre-internet decade of the late 1970s. Usually, the only image sources of mythical beasts that an artist could find were in resource books within a library’s reference section—in different encyclopedia sets, various dictionaries, and Bestiaries. Lucky visits to out-of-town libraries might net different source imagery. Since reference books could not be checked out, I always had to be sure to carry enough change with me for photocopying, just in case. When it came to locating depictions of unusual creatures, how many times did the Lake Geneva Public Library staff point me to their large collection of children’s books? When it came to fairy tale and children’s book illustrators, I always preferred the work of those living earlier in the century—Arthur Rackham, Edmund Dulac, Aubrey Beardsley, and Kay Neilsen. RPG fantasy illustrators during this period spent most of their income developing their own resource libraries. Dover Publication reprints made life easier for many of us. Fortunately, I was interested in mythical creatures long before I moved to Lake Geneva. Much of my resource library began with postcards and books purchased at London museums. In 1974, I spent the fall in London as a participant in Beloit College’s Studies Abroad Program. Both the Victoria & Albert Museum and the Tate Gallery were only a short walk from where we stayed. I enjoyed the gallery of Turner’s canvases and admired his ability to immerse me into his passionate experience of the sea. I marveled at the paintings of John Constable and studied the works of the Pre-Raphaelites. I also responded to the work of Heinrich Kley, Gustav Doré, Virgil Finlay, Frank Frazetta, Gustav Klimt and MC Escher. Of the many exquisite collections within the British Museum, I found myself most often visiting the manuscripts they had on display. From the very beginning, my passion for letters developed concurrently with my passion for art. In London, during the entire fall of 1974, I took classes in the art of calligraphy from an advanced Craft Member of the prestigious Society of Scribes and Illuminators. There is something about combining illustrations with text that is very satisfying for me. Art Nouveau artists had different ways of juxtaposing words with imagery. I loved it all. By December, I’d created a medieval-styled book in which I wrote out the text in calligraphy, illuminated the pages and created the illustrations. I am a big admirer of William Morris (of the Arts and Crafts movement) and William Blake, both of whom advocated the thoughtful integration of imagery with the written word. 3. Nearly 30 years after they were first published, the maps you created for the World of Greyhawk fantasy setting have no equals in my opinion. Can you tell us a bit about the process of creating them? Each 22″ x 35″ map was created “to size” and almost too unwieldy to fit on the surface of my drawing table. The artwork I prepared in layers, with the black layer—the hex layer—on the bottom. Using black ink, I worked directly on the surface of the foundation hex layer. I inked in pictorial representations of individual mountains, trees and other geographical features and organically integrated them with different styles of lettering. Transparent acetate was placed atop and I applied color to the map through the use of large adhesive pantone color sheets. 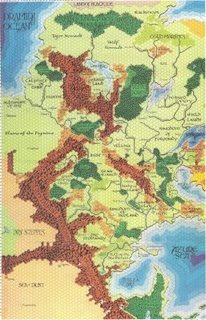 I approached the WOG maps as if they were large illustrations. For me, the art of creating letters is another specific way of drawing (I also design of type fonts) so I don’t consider words as separate from illustration. As a lover of letters, I have developed an advanced sensibility for balancing and juxtaposing positive and negative shapes. That’s how I achieved a certain pleasing integration of image with text that translates as satisfying. Anyone unfamiliar with the subtle nuisances of letterform design will be unable to replicate the overall aesthetic effect my gaming maps possess. Up to now, I’ve spoken little about my advanced intuitive abilities. Being able to access and enter subtle energy states (without the use of drugs) is just a part of who I am. Because people have a tendency to be dismissive about the subject, I don’t often share much about my regular excursions into the supernatural. I don’t believe it’s all that unusual: the ability to enter subtle realms is a normal part of the human experience. We close it off because we’ve been taught to do so. However, I chose to bring it up because it’s another hidden component of the WOG maps that’s pertinent to the discussion. While working on the maps, I reached my mind across space/time and tapped into the knowledge of a medieval artisan versed in the craft of map-making. From my point of view, the wrinkled hands of a knowledgeable old cartographer became superimposed on my own and “we” worked on the map together. I don’t mean to infer my WOG maps were channeled. My mind was definitely clear and present during the entire creative process. My hands simply “knew” what to do. The resulting map art became more informed by my ability to draw upon this deep internal resource. I think gamers may be responding to an energetic residue that the map still retains from these sessions. That’s another reason the maps are so impossible to duplicate, and probably represents the best explanation of why those WOG maps possess such an air of authenticity. 4. I recall that you not only illustrated but also designed a fantasy card game called Jasmine: The Battle for the Mid-Realm. Can you tell us a little about how it came about and if you ever intend to return to it? Thanks for asking. My card game sprang directly from the interactions of the characters from my The Story of Jasmine™ fantasy-adventure saga that ran in The Dragon Magazine from May 1980 to April 1981. I sorted my story characters into four factions, each possessing different and unique strengths and attributes. Since the card game is character-driven, it’s only natural for players to ad lib assuming the personae and traits of their particular faction during game play. Just in time for Gen Con XV, I created the first role-playing card game. 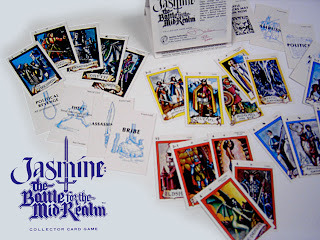 The publication of Jasmine: The Battle for The Mid-Realm™ collector card game in August of 1982 officially marks the first appearance of 1) a role-playing game using playing cards and 2) game-related cards being heavily illustrated. I was honored at Gen Con’s Ninth Annual Strategist’s Club Awards for creating the “Most Outstanding New Game in an Open Category” and still have the plaque. My card game system defines three types of playing cards–faction cards, event cards, and special cards–each with unique actions which can change depending upon what other cards are in play or which factions are holding them. This is unique, both then and now. In his TD review of my game in August 1983, Merle Rasmussen wrote: “JASMINE incorporates a few old ideas with many new ones to create a fresh approach in card-gaming.” Another positive review of my game appeared in Avalon Hill’s Gameplay Magazine. Despite the assertion on Wikipedia to the contrary, I did have plans to publish expansion decks with the intent of introducing the other characters within my Story of Jasmine fantasy. The game play of the green faction cards (defining the ways the King of UR and his Army cards can be used by any player) is proof I originated this seed idea. This was ten years before WOTC falsely claimed the patents, alleging that the idea of a role-playing card game belonged solely to them. They employed too many former TSR people who had copies of my game to not to know that I was the first to come up with the concept. They also violated my copyrights by republishing The Story of Jasmine™ fantasy-adventure saga without my permission. Jasmine: The Battle for The Mid-Realm™ collector card game is also the first game to combine card actions with full color paintings in the context of playing cards. I lavished much attention on the details of the fantasy artwork. Unlike most card decks in use at the time, I illustrated all 112 playing cards. For the forty Faction cards, I created full color miniature paintings and assumed the expense of four-color printing. Additionally, I illustrated the Event and Special Cards, printing them in two colors. Some years back, the legal department at Disney contacted me. They informed me that if I didn’t fight it, that they were going to use the name Jasmine. At the time, I didn’t have the means to defend my trademark and so was forced to relinquish it. For those interested in owning a piece of history, Jasmine: The Battle for The Mid-Realm™ collector card —all numbered and signed from the original stock, is still available. 5. You had the chance to work with Gary Gygax again on a couple of his Castles & Crusades products for Troll Lord Games. Did it feel like a "homecoming" for you, artistically? Sometime in 2003, Gary Gygax initiated contact with me. As our resulting correspondence blossomed into a new friendship, I very much enjoyed getting to know Gary and his wife, Gail better. My husband and I enjoyed some excellent visits with them in Lake Geneva, musing and reminiscing on their wrap-around porch. During our e-mail discourse, from time to time, Gary would broadly mention his desire for another good fantasy map, writing things like, “Everyone thinks your The World of Greyhawk maps are amongst the best ever done…” But I refused to take the bait. Professionally, for over two decades, I’d been squarely within the bounds of “the real world.” In light-hearted ways, I evaded Gary’s attempts to interest me in doing another set of maps for him. But he had an ally in my husband, also an avid gamer. Within six months, I stepped back into the RPG world. Yes, artistically it was a great home-coming. During 2004/05, I created a new two-map gaming set for Gary’s Castle Zygag. Also for Troll Lord Games (TLG), I poured my creative juices into the first four issues of their The Crusader Journal, and also wrote some insightful articles. I also created some character sheets, and did other miscellaneous module and book design for them. I enjoyed the work itself, the sense of camaraderie, and close creative association with Gary. My return to RPG ended up being brief. In an industry run by hobbyists, I found nothing has essentially changed in terms of aesthetics. People who possess an educated eye for balance, proportion, and beauty will be stymied by people who are not sensitive to such things. RPG Hobbyists have different expectations, priorities and ideas about what is important to a project. Been there, done that! Any art professional who is established outside of RPG will find it difficult to cope with the assumptions of people unacquainted with the ethical standards of the graphics industry. Besides, having worked for design agencies where the price for a single logo starts at $1500 and it costs $150 per page for design, it was too tough for me to continue walking backwards. 6. What have you been up to lately? Is there any chance you might again work on some RPG projects? My life-long search for deeper meaning has brought me full-circle—back to my beginnings. I used my thirty years away from RPG to explore all aspects of the deeply profound relationship between art and spirituality. Somewhere along the way, I became a Sacred Artist. I’m defining Sacred Art as art created through a spiritual connection to one's soul/essence and to the Divine. Right now, I am choosing to embody the archetype of the Muse—one who inspires creativity, vision, imagination and expansive thought processes. On a transpersonal level, the Muse helps people to birth and recreate their own reality so that life becomes an art form. In fact, “Art is Life, Life is Art” is my motto. To recap, I believe synchronicity brought me back to RPG. I needed to return to this part of my past to recognize, value, and reclaim the fullness of my power. What I thought had been missing from my life turned out not to be missing at all. I needed to understand that I’ve always been a natural spiritual conduit and have been practicing Sacred Art all along. Some of my RPG fans have reported extra-ordinary experiences with regards to some of my old DMG art. If not for their accounts, I would not have gained an appreciation for my art’s great energetic potential. The mechanism of energy transference into art is simple to understand. One way it can be accomplished is through “focused intent.” The process of fixedly concentrating upon a certain thought while engaged within a creative artistic activity can leave a sympathetic psychic frequency capable of objectively being felt and accessed. That’s my most hidden, but also my most powerful contribution to RPG. Think about the creative dynamic, of how adding an energetic feminine counterpoint would tend to have a catalyzing effect upon a male-dominated industry. My gender role within RPG concerns the science of how complementary flows of energy impart spin. Though never consciously intended, I intuitively functioned as Shakti to TSR’s Shiva. My role as the feminine presence within D&D has always existed, but just below the surface. Instinctively, someone within TLG grasped the concept in 2006 at their Lake Geneva Gaming Convention, and gave me the title, “Our Lady of Gaming.” That designation crystallized things for me. Why not? I seldom participated in game-play as a competitor. Thus, I wasn’t “in” the game as much as “of” the game. Nevertheless, whenever I entered a game room to observe, my presence was always felt. Long before I realized it, I served as a type of inspirational Muse for RPG. In the chivalric sense, I AM “The Lady,” who makes one’s adventuring worthwhile. One good way to explain how my art (and I) have functioned on a trans-personal level would be in Jungian terms. Through projection, I have represented (often inadvertently) the feminine component within the male psyche. From the very beginning of RPG, I’ve served as an anima projection for the gamer, a mirror. Since I reflect a man’s relationship to the feminine aspects within himself, men’s reactions towards me are as varied as their internal relationship to their animas. Now at last, I honor my ability to embody “The Feminine” and choose to embrace it as a part of my skill set. I must be very careful about what I choose to birth into existence. It’s highly unlikely I’ll be doing much of anything more for RPG as a group. Besides, my passionate interest in spiritual art seems to clash with the comfort level of most gamers. But I won’t close any doors. I reserve the right to stir my creative juices by working on an individual basis with people who appreciate the depth of what I have to offer. Since the beginning of 2009, I’ve been experimenting with creating digital paintings. I recently created a new, digital re-interpretation of my only published Dragon magazine cover (TD#37). Painting with light and vibrant color feels very freeing and fun. It’s like and yet, unlike traditional media. Within every pixel of “Maiden and Unicorne” I consciously placed exuberance and joy. Then something unexpected happened. The moment I achieved the “right” energetic for the image of the Virgin, the healing potential of the unicorne descended into the art! So this is my parting gift! I offer the actual healing power of the unicorn to anyone open to the possibility. But don’t take my word for it. I invite your readers to check it out for themselves. BTW--the auction of my RPG art has yet to happen. It’s still possible to own a chunk of the past from the woman who once stood at the center of RPG. NO MORE RGP'S?? NOT EVEN ONE MORE??? WE WILL HOPE THAT YOU FIND A PROJECT THAT IS WORTH IT (ANOTHER GRAYHAWK MAP I HOPE!!! Wow. I very much grok what Darlene is saying about imparting one's own spiritual experience through her art. I have observed others dong so; I wish my own visual arts were as masterful. Thank you for sharing. I was already a fan of Aubrey Beardsley and Kay Neilsen (being married to an artist for 14 years has its advantages), but I'd like to thank Darlene for introducing me to Edmund Dulac. Oh, and thanks for all the imagery over the years. The Greyhawk maps stayed posted on the wall in my bedroom from 1983 until long, long after I'd moved out on my own. "The moment I achieved the “right” energetic for the image of the Virgin, the healing potential of the unicorne descended into the art!" Best unintentional humor this week! But seriously, Art Nouveau rocks and we could use contemporary art that actually tried to to achieve truth, beauty, and craft. But then compared to our post-modern sacrilege and scatology that masquerades as 'high art' ANY previous artistic school is the acme of skill and style. Considering all the lies and misinformation spread by Fundamentalist Christian groups in their attacks against role-playing in general and D&D in particular in the 1980s, it's always interesting to note that many of the hobby's original creators and advocates were indeed practitioners of magic and other modes of alternative spirituality. It's to the detriment of all of us that RPG creators could not be more open about their ideas and influences due to the prejudices of the greater society and I'm grateful and inspired to see so many coming out of the broom closet, if you will, and feeling that they can now share with us what they were truly thinking and feeling when they were building the foundations of the hobby without fear of reprisal. Thank you Darlene. Are you endorsing Darlene’s world view? Do YOU believe in fey and magic? Have you forgotten the Nicene creed? This is an interview. I neither endorse nor repudiate anything Darlene or anyone else I interview says and I don't expect any of my readers to do so either. However, I do expect them to treat my interviewees with respect, even when they disagree with what they might say. If you or anyone else has a sincere question for Darlene about what she's said in the interview, you're most welcome to post it here in the comments. However, I don't want to see these comments become an occasion for ridicule or reproach. I don't think it's too much to ask that everyone behave themselves, not just on this interview but on the ones to come, some of which have content at which some may take umbrage. Thanks Darlene and James for this most interesting interview. I've always been fascinated by Darlene's work in the 1E AD&D DMG. Darlene has always remained something of an enigma to me though as she has been long absent form the gaming sphere. That is a beautiful cover of The Dragon. The only pity is that it doesn't have The Dragon's original way of writing "The Dragon". That would have suited Darlene's painting better. I'm no hippy, but there does seem something magical about Darlene's art. Thanks for the interview. I agree with labsenpai. I also thought it was interesting to see her point out that, for all our hand-wringing about corporatization, RPGs are still really just a hobby market. Too true! Great interview. Hooray for weird metaphysician/artists! James, you do a great service here. This is a wonderful read - I hope the artist knows that there are many people who were affected by her work, and it is good to see that she has strength and peace. artistic quality to a male dominated game.....inspiring stuff! Awesome interview! I am a firm believer that when you let yourself enter an altered state while pursuing an artistic endeavor, you open yourself up to results that are beyond the ordinary. Buried in every mind is the capacity to recognize beauty and art, and if you abandon conscious control over your actions you can tap into that capacity and produce truly timeless works. It is easier for me to enter that state while playing music because I have far more practice entering that altered state, but every now and then I manage to do it while drawing. A very illuminating interview - thank you, James and Darlene! I've enjoyed Darlene's art so much over the years - it's disappointing to hear how talented people can be under-appreciated and misused. I'd like to remind everyone of Warlock, published by Games Workshop in 1980. It is often overlooked in gaming history, yet was very influential on many subsequent games (such as Magic: The Gathering). Warlock had a large deck of beautifully-illustrated playing cards that represented the spells cast in a magical duel. I played Warlock a lot in my youth, and can recommend it, if you can find a second-hand copy. Thank you Darlene. I recognize your work, and you created a wonderful world for me to imagine as I grew up. I agree that you were uniquely suited for making TSR the magical thing it was.